Heat grill. Cut 15x12-inch piece of heavy-duty foil; spray with nonstick cooking spray. Unroll dough into 2 sections on sprayed foil; do not separate into breadsticks. Press or pat each section to form 7x6-inch rectangle, sealing perforations. Cut hot dogs lengthwise to but not completely through other side; open hot dogs to lay flat. When ready to grill, invert dough onto grill rack and peel off foil; place hot dogs, cut side up, on gas grill over medium heat or on charcoal grill 4 to 5 inches from medium coals. Cook 4 to 5 minutes or until bottom of dough is deep golden brown. Turn dough; brush with ketchup. Place 3 hot dogs, cut sides down, on each rectangle of dough. 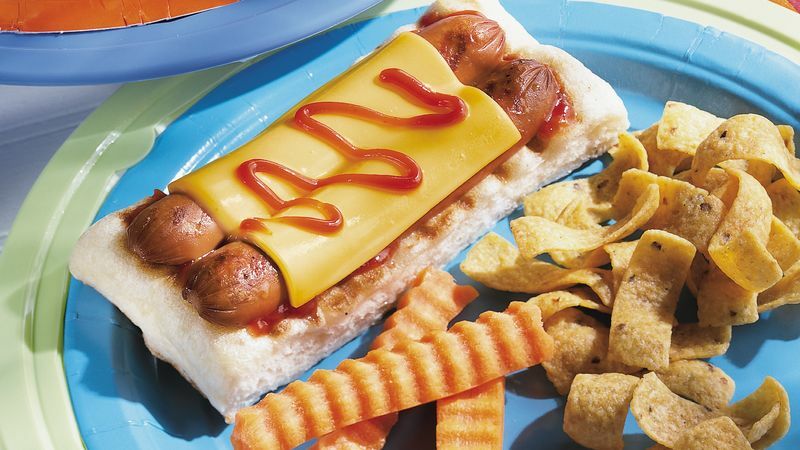 Cook 4 to 6 minutes or until bottom of dough is deep golden brown and thoroughly cooked, topping each hot dog with cheese during last 1 to 2 minutes of cooking. To serve, cut between hot dogs. If desired, serve with additional ketchup or other condiments.